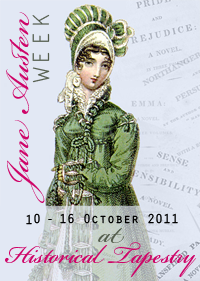 Some time ago I started reading Sense and Sensibility by Jane Austen for the Classics Circuit. I never quite got around to finishing the book, but as a result of Jane Austen Week over at Historical Tapestry I decided that it was time that I finished off those last pages of this book, and I did! I posted about my initial reactions to the book, but now I thought I would just post something more because I feel quite accomplished that I have finally finished an Austen novel! Elinor made no answer. Her thoughts were silently fixed on the irreparable injury which too early an independence and its consequent habits of idleness, dissipation, and luxury, had made in the mind, the character, the happiness, of a man who, to every advantage of person and talents, united a disposition naturally open and honest, and a feeling, affectionate temper. The world had made him extravagant and vain - Extravagance and vanity had made him cold-hearted and selfish. Vanity, while seeking its own guilty triumph at the expense of another, had involved him in a real attachment, which extravagance, or at least its offspring, necessity, had required to be sacrificed. Each faulty propensity in leading him to evil, had led him likewise to punishment. The attachment, from which against honour, against feeling, against every better interest he had outwardly torn himself, now, when no longer allowable, governed every thought; and the connection for the sake of which he had, with little scruple, left her sister to misery, was likely to prove a source of unhappiness to himself of a far more incurable nature. One of the things that you hear about Jane Austen's writing is that she is excellent at writing the human condition, but that she has not lost relevance in these modern times. I have to say that when I read the first part of this passage it was very reminiscent of the constant comments that you hear about "kids today"! I am so glad that I finished the book eventually. Now I need to decide which of her books to read next. I am leading towards Persuasion, but if you strongly recommend another read let me know in the comments. We still have some Jane Austen Week giveaways happening over at Historical Tapestry so head on over for your chance to win! Persuasion is my favorite Austen but I would actually suggest EMMA or PRIDE AND PREJUDICE for you next. But anything will do! :-) I'm glad you enjoyed this one! Sense and Sensibility is my least favorite Austen, so I do want to give it a reread at some point. I agree with Marie about going with Emma or P&P next just because they're the most well loved and most discussed. I personally love all of Austen's books, so in the end I don't think you can go wrong! I can't say this one if my favourite Jane Austen book (that crown belongs to Persuasion) but I agree with you on Austen being excellent at writing the human condition... She knows how to create multi-dimensional characters that are easy to identify with. I love Austen but I sort of try to ration them out because there are such a limited number of them. I haven't read this one, but if you are planning on reading Persuasion sometime soon, maybe we could read it together? I'd love to read that one next. Let me know what you think! My favourite is Persuasion, but it's very close with P&P, both of which I truly love and try to read every two years or so. So glad that you finished this one. I loved it almost as much as P&P. I have yet to read any of her other works but next year will be the year I read for myself and I have her books just waiting for me! Yea! Sense and Sensibility is my favorite followed by Pride and Prejudice and Persuasion. I'd suggest Persuasion next. I'm trying to read all her books by the end of the year. I've got Emma (which I didn't like on my first attempt but I'm giving it another chance) and Lady Susan to go. I'm re-reading S&S right now. I say go with Persuasion; it's my favorite! Oh, I have to admit that I have never had very much luck with Austen. A few year ago I just gave up and said that she wasn't for me and I was going to have to live with it. Sigh. Aarti, Amy, Marie and Anna, Persuasion is definitely the next one! Pam, which books of hers did you try? Staci, oh, reading for yourself sounds interesting. Susan, I would run off with the Colonel as well. Of course, the age difference wouldn't be such a big deal for me and him! Zibilee, I am looking forward to reading Persuasion with you! Kailana, you will get to it eventually. Reviewsbylola, spoken like a true fan! Persuasion is the last Austen I have to read...I'd suggest Pride and Prejudice, love that one the most!